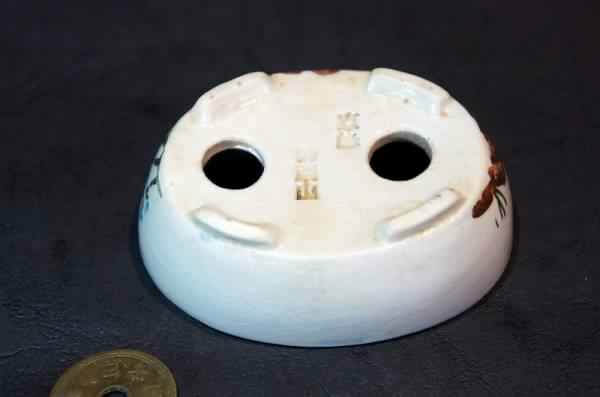 Ogurayama - or Karahashi Homiyabi was born in Kyoto in September, 1920 and has been making bonsai pots since the mid 1970's. 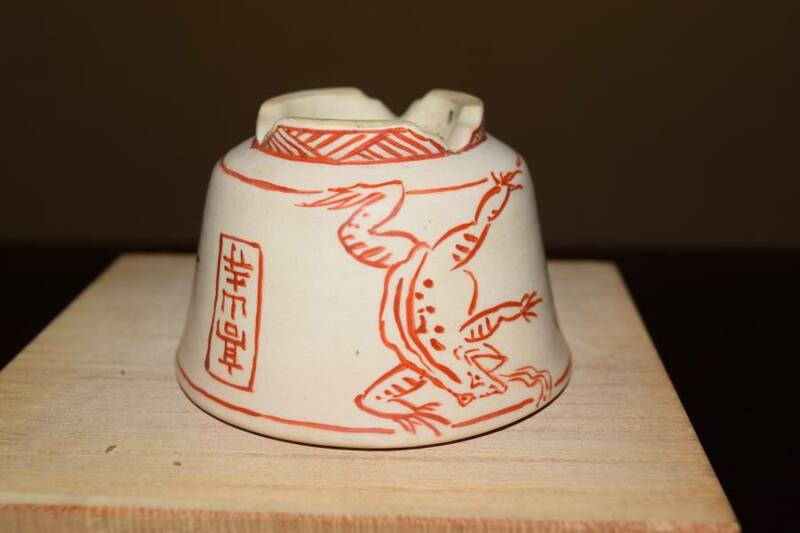 He became well known & revered after entering and winning the National Masterpiece Kobachi Exhibition in 1981. 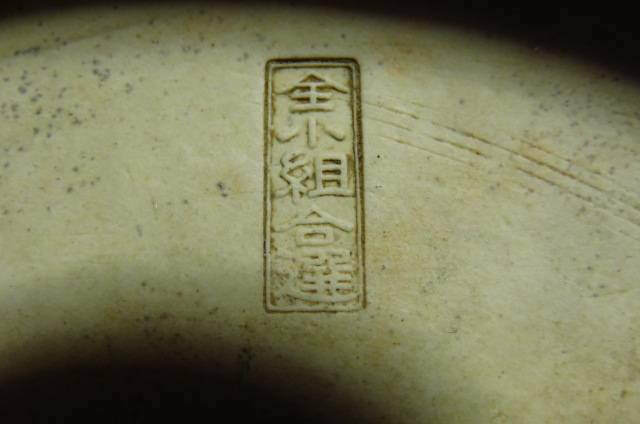 His works had been used consistently at top Japanese exhibitions since. 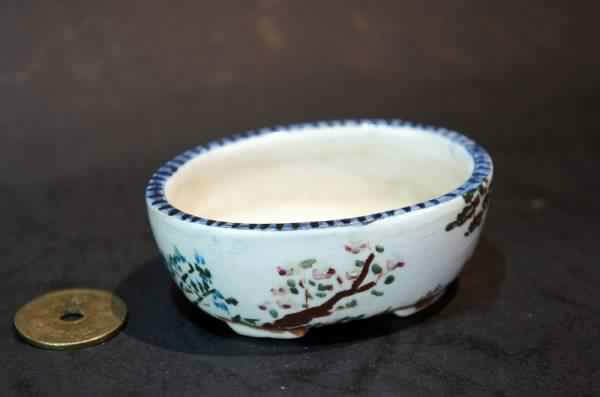 Ogurayama's painted pots are varied in shape style and technique, although the use of the Kyoto traditional style of painting is prolific. 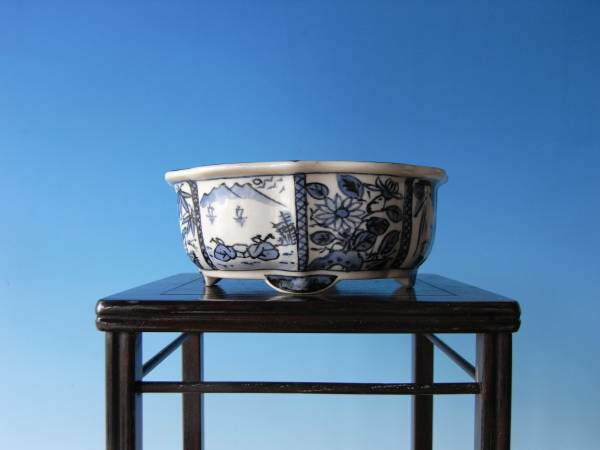 A precision made piece, with details such as incised corners and base panel. 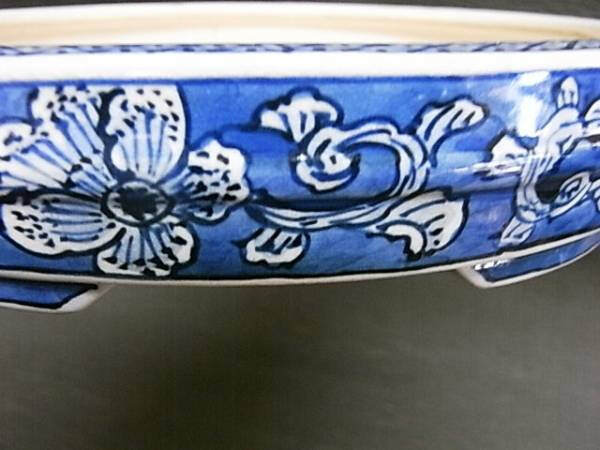 This piece is more carved than painted. 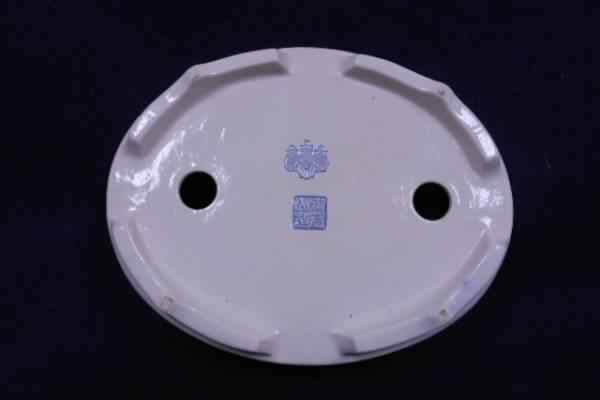 The designs are relatively simple, yet imaginative, fun & well executed. 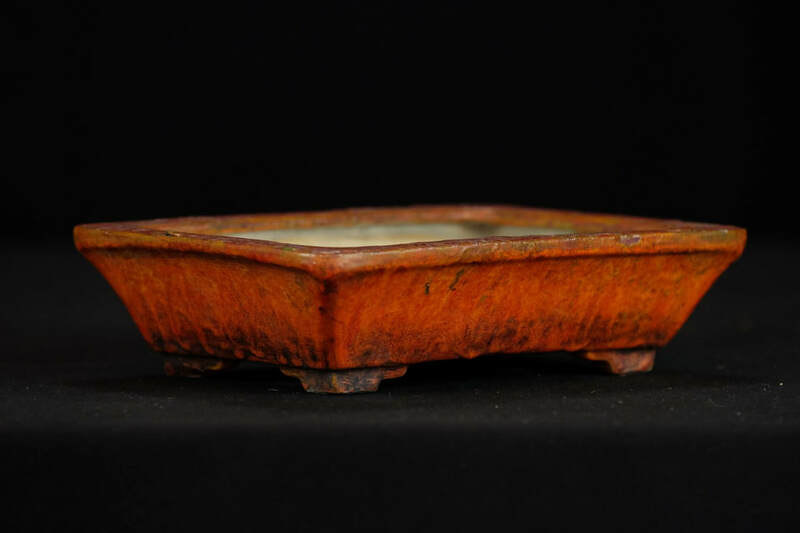 The subtle over glaze reds contrast well with the golden glaze and browner areas of thick glaze. 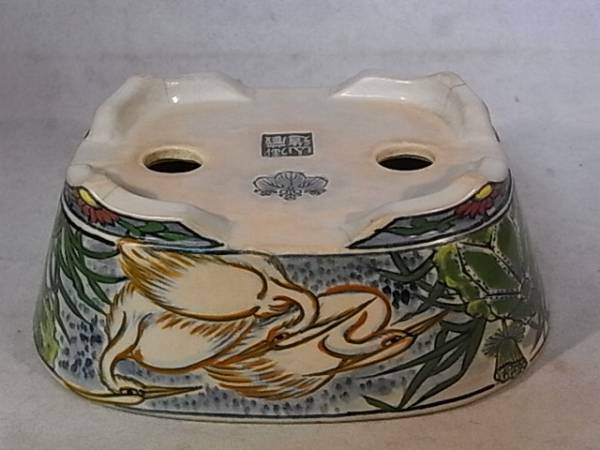 Mokko sometsuke shohin with painted cat. 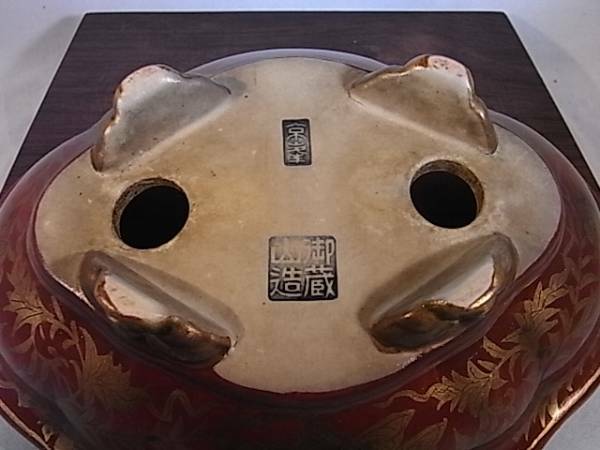 The painting of the cat is almost sketch like and arabesque patterns fill the remaining faces, which continuing to the feet. 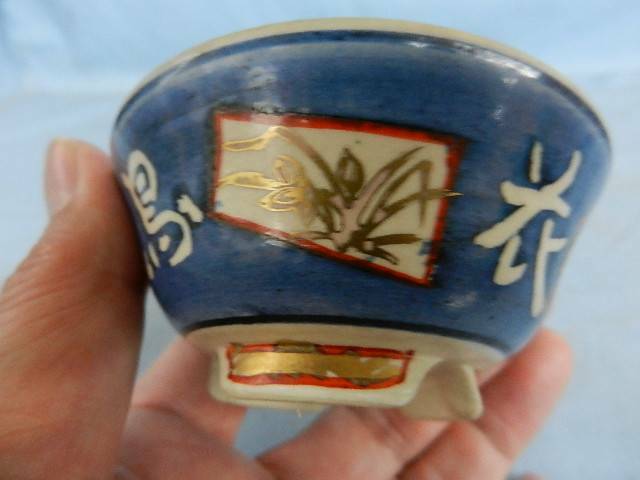 Suiban in black with gold and white waves and 'Chidori' 千鳥 (Plover bird). 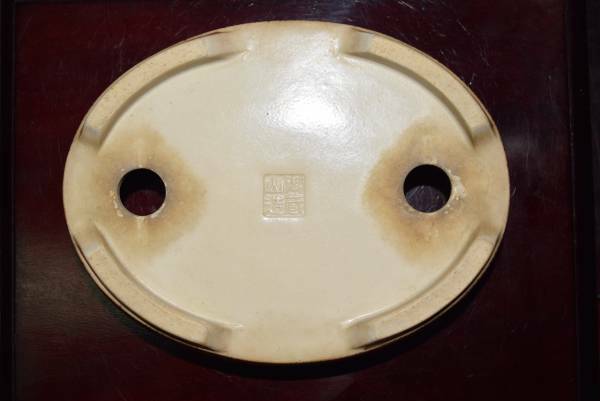 The inside of the suiban is not painted as is often the case with these painted suiban. 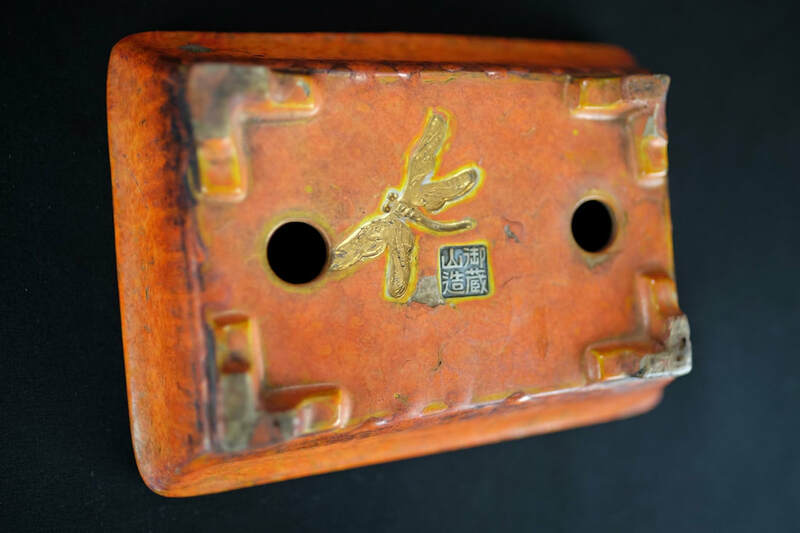 A stunning rectangle glazed in a fiery orange with good age and a carved, inlayed gold dragonfly under the pot. 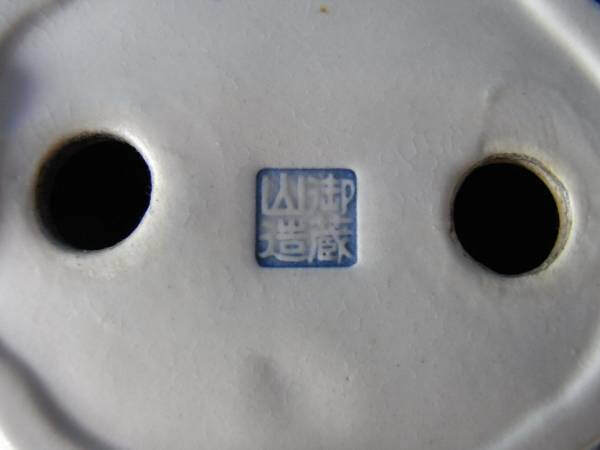 As with painting the inside of a suiban, top quality pieces can have their most beautiful paintings hidden when in normal use. Only a few people will know of their existence. 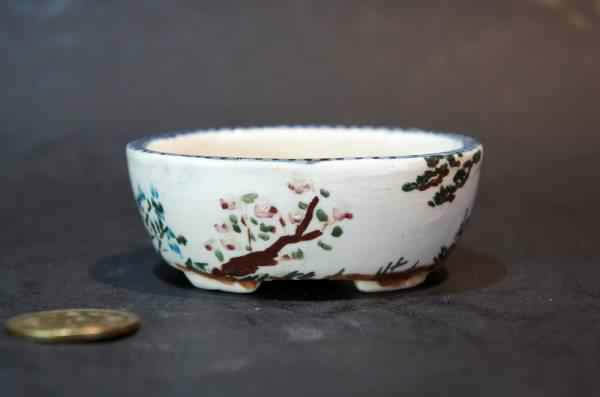 A fun mame oval in porcelain, painted in go-sai / 5 colours, with images of foliage and a small flowering tree. 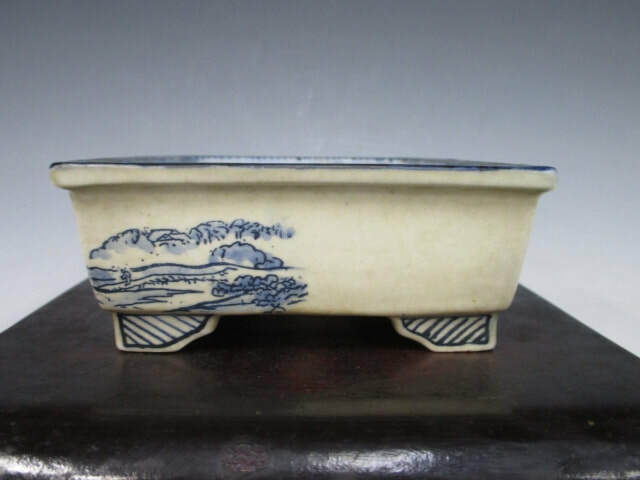 Although a small pot, less fine brush strokes have been used. 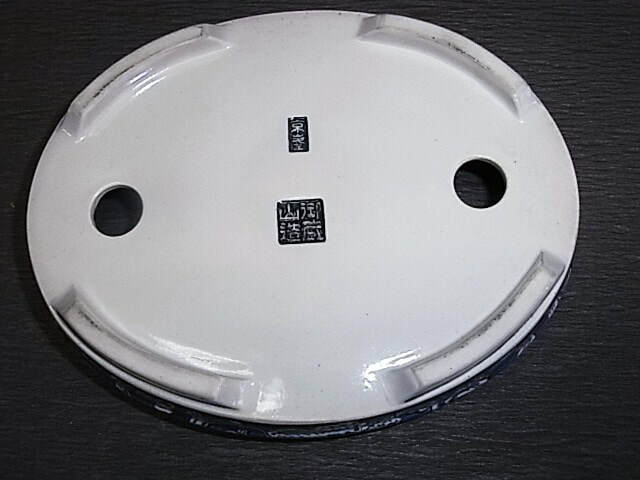 As with most, the rim of this small pot is also decorated. 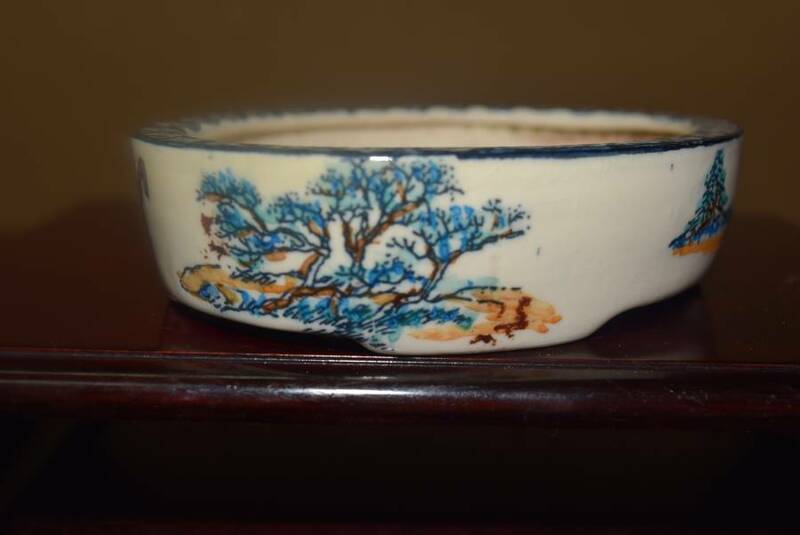 Another glazed piece with a small hint of over glaze painting. Here a simple geometric design in yellow and green, with gold boarder. 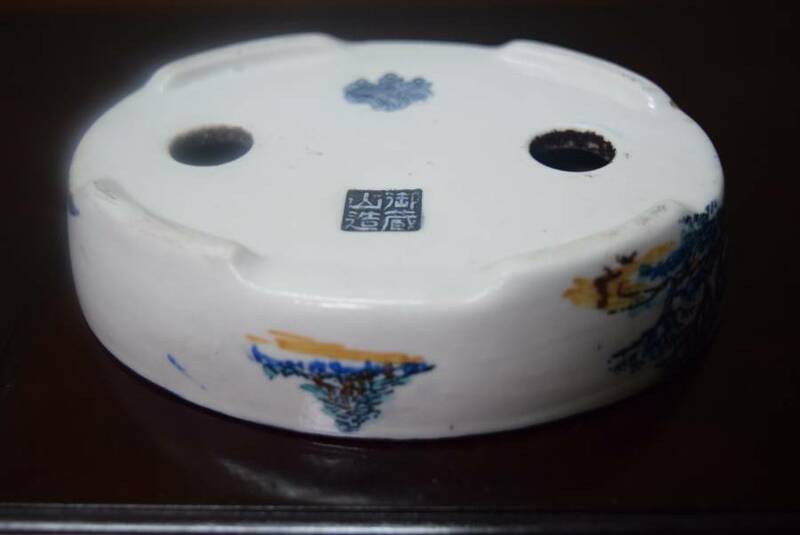 A fine sometsuke painted rectangle with some age and patina building. 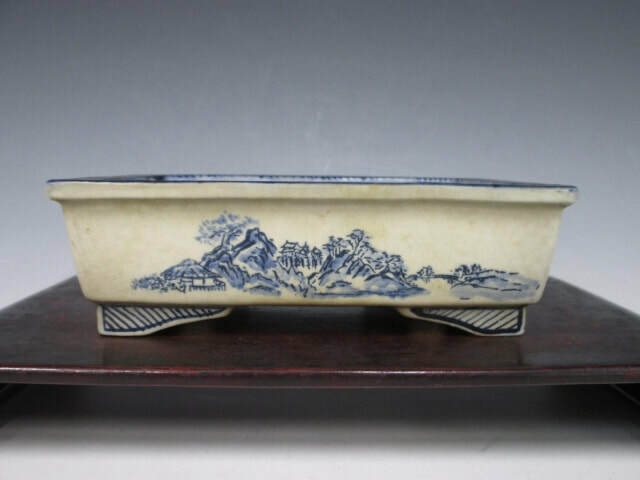 The sansui scene is quite sparse, allowing the viewer some imagination. This use of negative space also gives a clear direction. 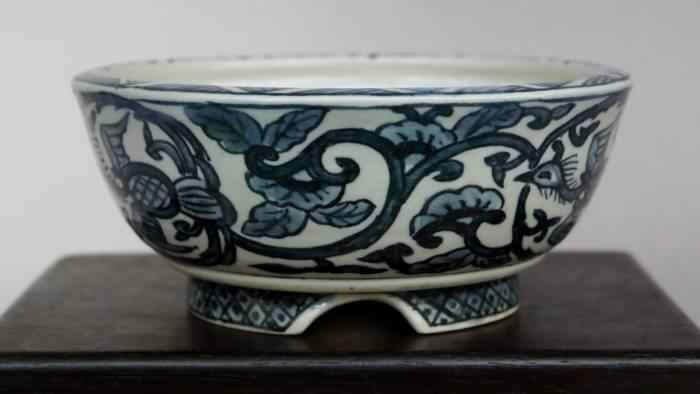 A round mame porcelain bowl, painted in sometsuke with images of arabesque grape vines in an Kyoto style. 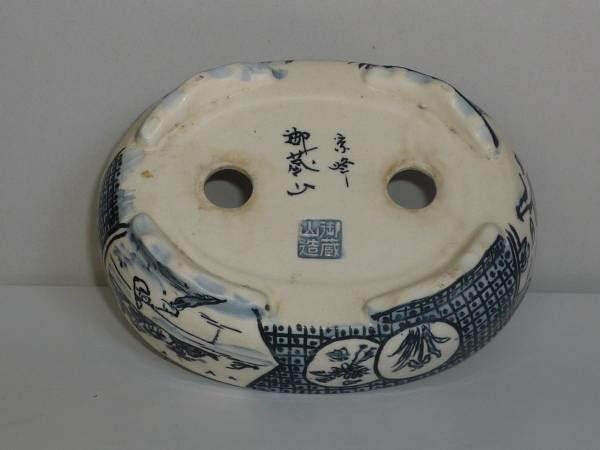 A good sized oval with a protruding central band, which somehow adds movement and life to the sometsuke flower images painted on a solid blue background. Clean boarders and a nice pattern to the rim. 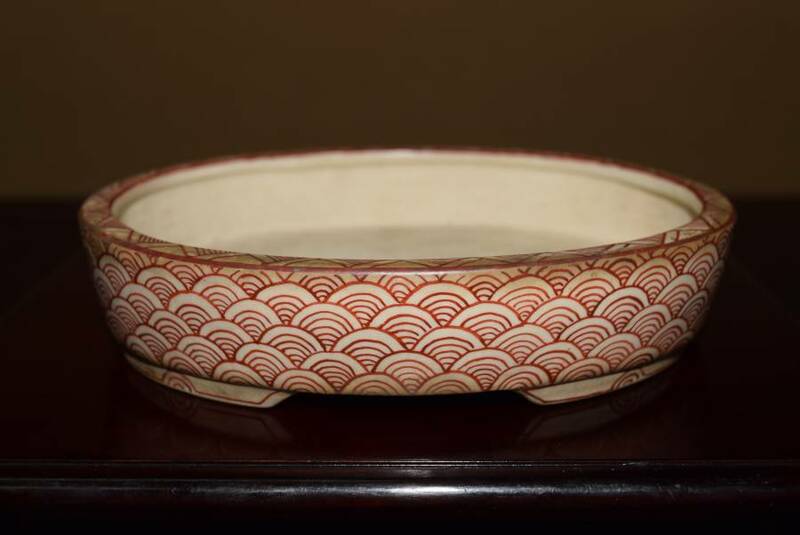 A simple yet detailed sometsuke oval with fine brushwork and patina building. 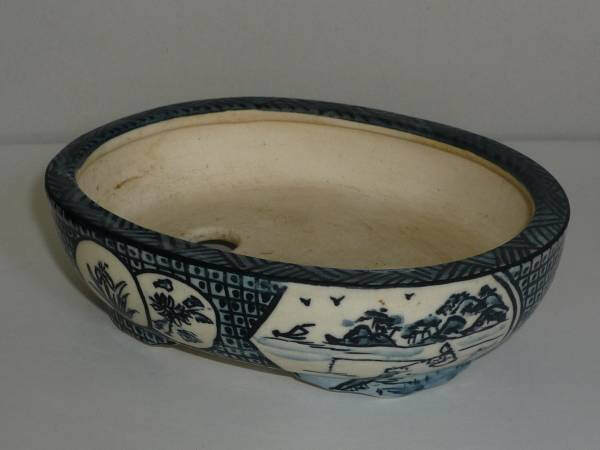 A delightful quince shaped bowl in a Kyoto style, with vertical bands of geometric patterns separating the main images. 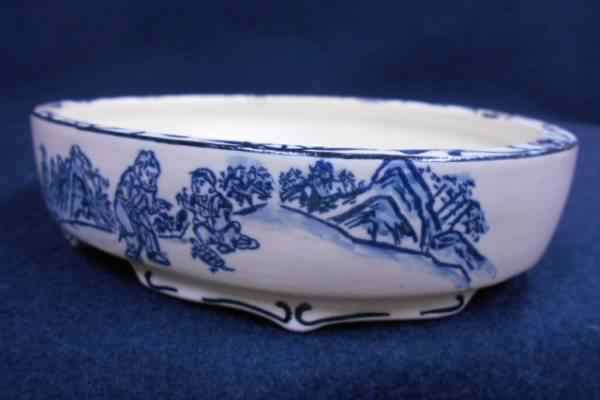 Sansui (mountain & water) scenes with fishermen characters, and painted flowers decorate the bowl. The painting is of a high quality with finer brushstrokes and great use of shading. 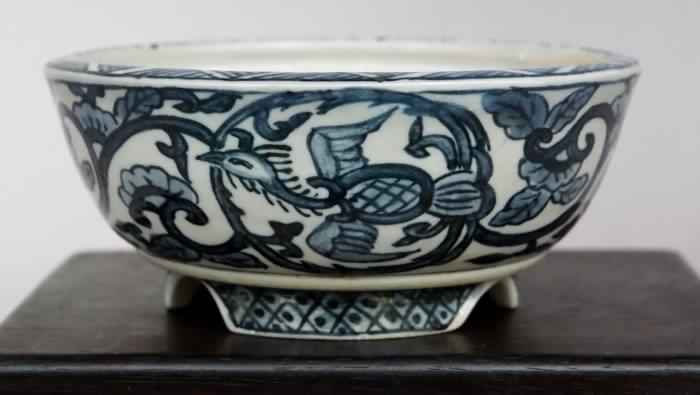 A wonderful arabesque sometsuke painted bowl in a darker cobalt and with a phoenix rising from within the flowers. The feet are nicely adorned. 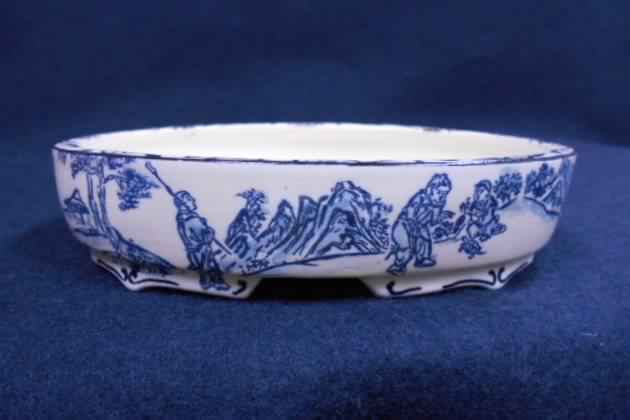 Sometsuke oval with sansui scene with characters, and painted cloud feet expression and rim. 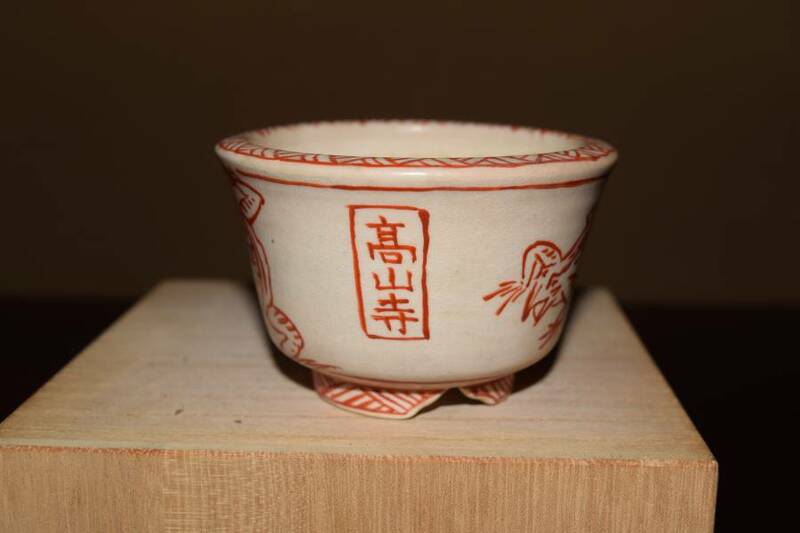 From a private Japanese collection. 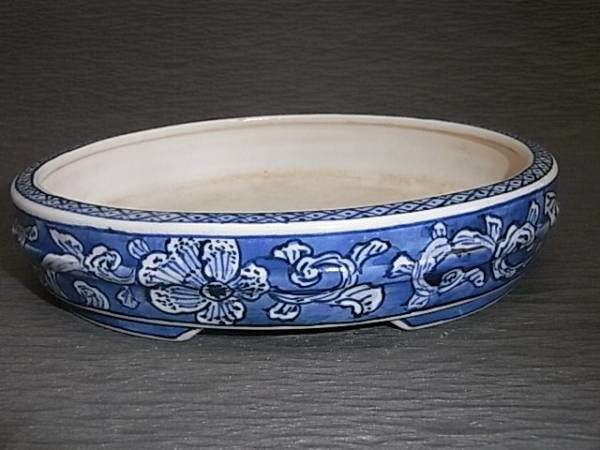 A stunning small bowl glazed in blue with red and gold overglaze. 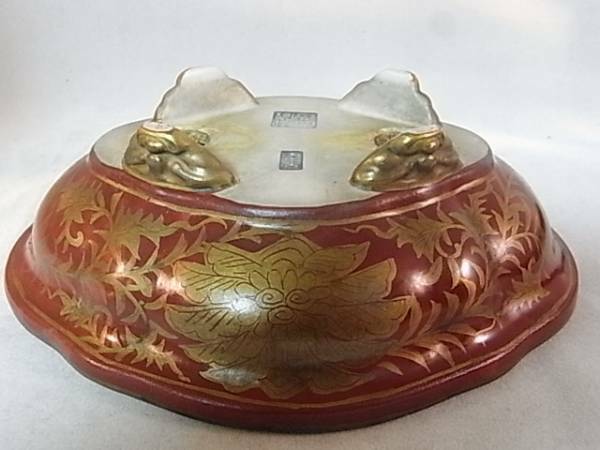 Chinese characters / kanji, including that for the moon (or month) 月 - are glaze free, and the gold images within red windows make this a stand out piece! 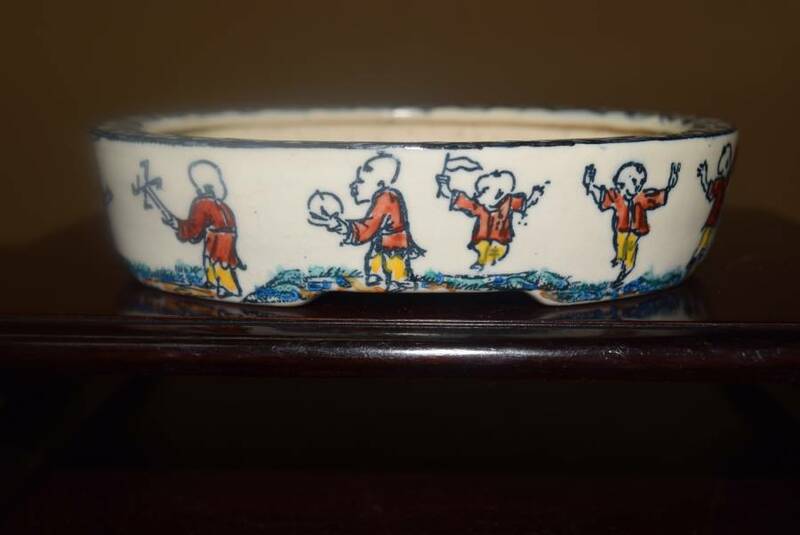 A fun go-sai (5-colour) oval depicting children playing and a clump of trees. The greenery is almost blue, which could reflect the fact that in older japan there was no colour 'green'. The very word for greenery / fresh leaves in Japanese is: 青葉　(あおば-aoba) Blue leaves. 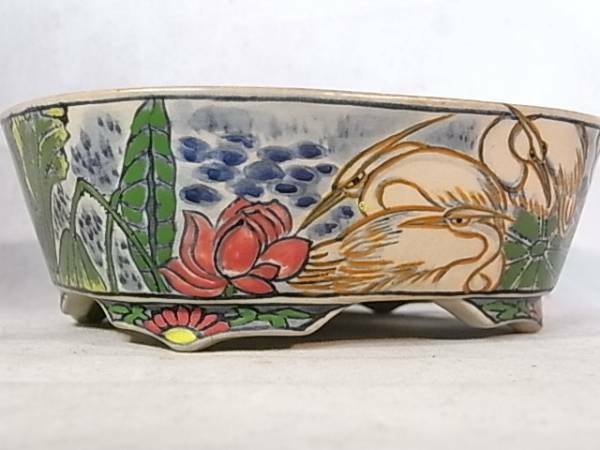 A wonderful 5 colour painted in a continuous scrolling scene depicting 6 Herons and the Lotus flower. Delicate brush-stokes and expert use of shading gives this image a wonderful depth. 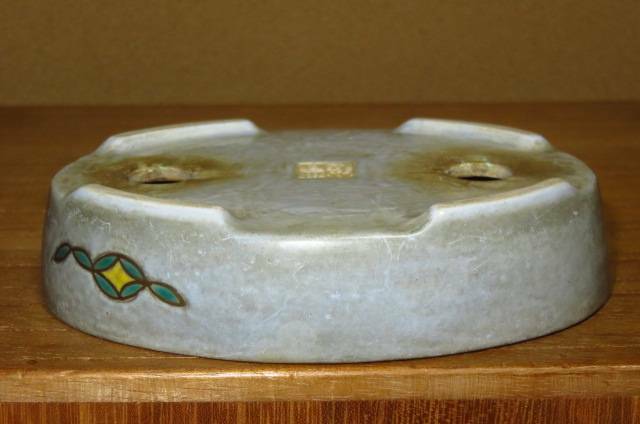 Ogurayama's pot construction is as good as his painting, as is evident in this older yellow glazed rectangle, with incised corners, carved feminine feet and carved underside panel. 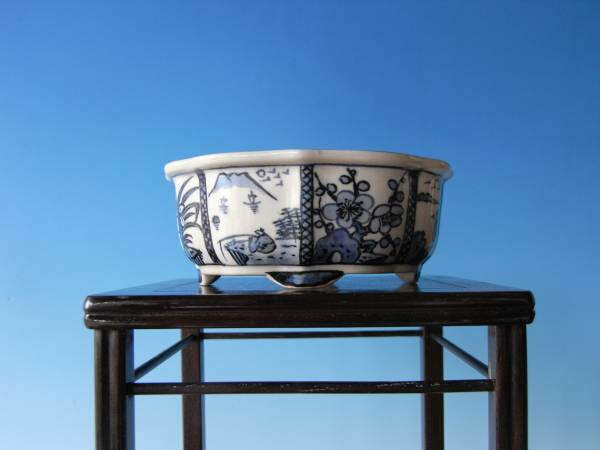 `The pot is adorned with wonderfully detailed go-sai scenes in mokko shaped panels. 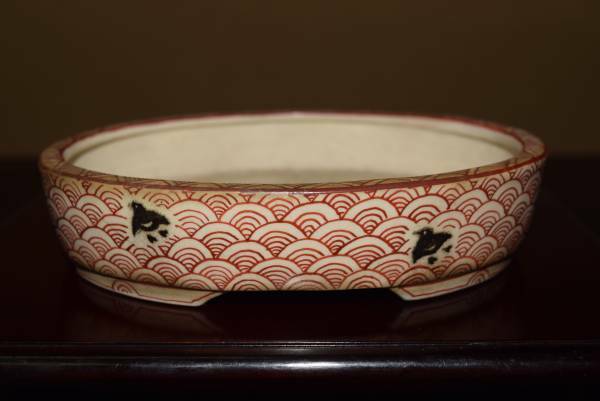 A wonderful mokko glazed in akae (red) with gold overglaze painting in arabesque flower design. The gold demon mask feet are quite exquisite. 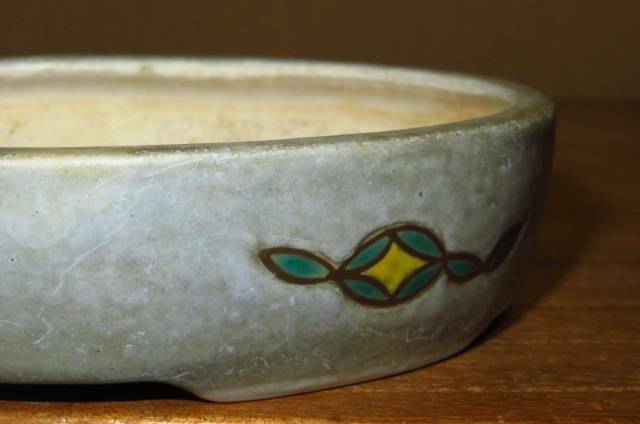 The gold overglaze, which has in parts worn down, together with the patina, show the age of this earlier piece. 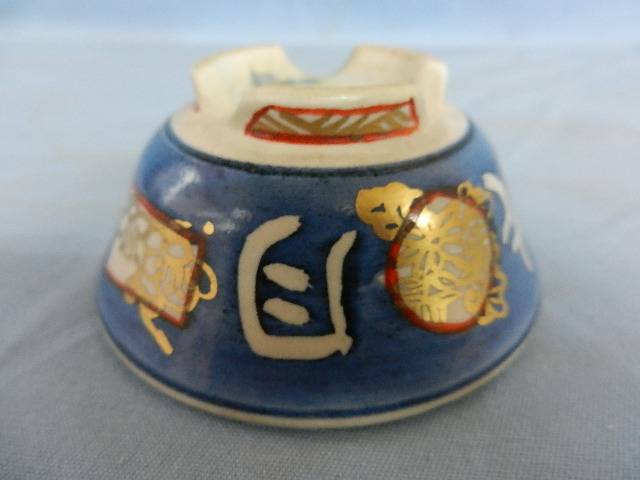 A fun mame sized akae painted bowl with a frog jumping to catch his fly. 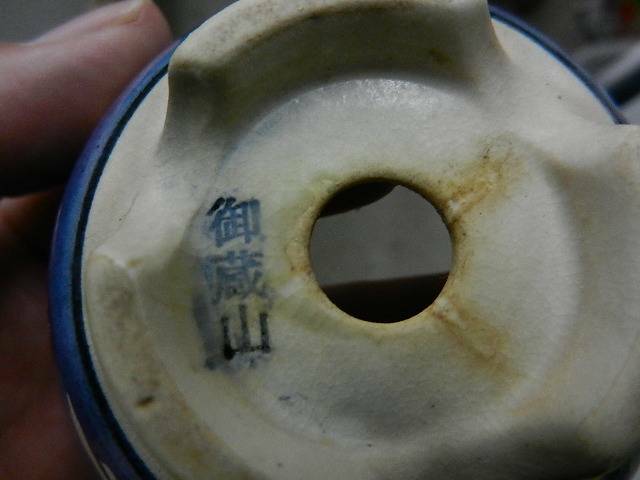 As can be seen on other pots by Ogurayama, the painted upper and lower bands have been breeched by the image within. 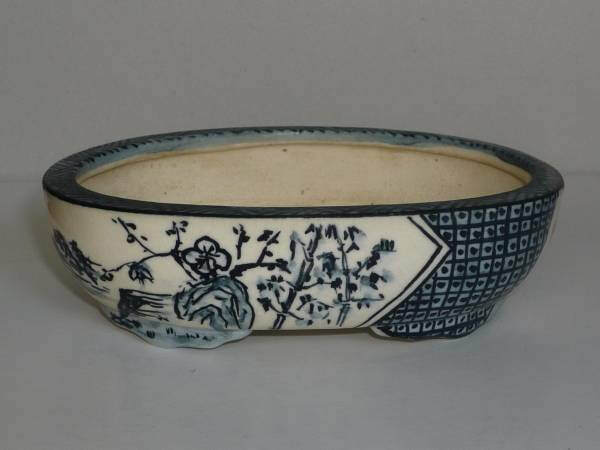 A beautiful oval in sometsuke with Kyoto style geometric patters and assorted shaped panels, each containing a detailed painted scene.